After Tommy was realized from the hospital back in February, we were extremely glad to have him at home again. With the coming days, we realized that RSV didn't affect just our boy lungs, but also his development. He lost many skills he was mastering or about to master, so we had to star over. It haven't been easy this time for me to keep up with all therapies due to I was pregnant. I felt exhausted because I have Insomnia since I was 2 or 3 months pregnant. So I feel the guilt of not helping Tommy as I used to. Now that I am in maternity leave, I keep working on helping Tommy to recover his physical strength every time I can or I try do it during his daily routine. Tommy lost a lot strength in his muscles so we are working on "Building Stronger Muscles" by incorporating new activities. I have also realized, more than ever before, that nutrition plays a huge role on how to help our kids with low muscle tone. So I have been searching for ways to strength Tommy's muscle from inside his body, as he would be an athlete, to get a better body's performance. This has brought me to learn more about nutrients and supplements to empower his muscles. Tommy and I are working on squatting exercises. According to wikipedia.org, "the squat is a compound, full body exercise that trains primarily the muscles of the thighs, hips and buttocks, hamstrings, as well as strengthening the bones, ligaments and insertion of the tendons throughout the lower body. Squats are considered a vital exercise for increasing the strength and size of the legs and buttocks, as well as developing core strength." Instead of a Water and Sand table, we are using water and sand little swimming pools. 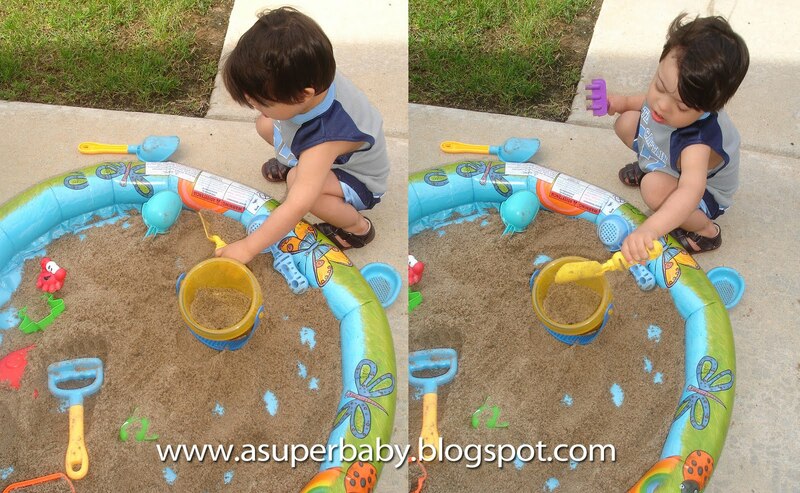 Tommy squats every time he picks a toy from the pools or stay in squat position while playing with the sand toys. I encourage him to pick up the pit balls from the floor and threw them in the water so he squats multiple times. While he threw the balls we also count from one to ten. in the water while I was counting. Other way we are working on squats is by sing the song "Turn around." This is a great way to combine singing with vigorous exercises. Singing is something Tommy enjoys the most. Honestly, I think Tommy he will have fun playing any sport when he gets older, but he won't be an athlete. Gross motor is not his strength. But he may be a musician because I had to hide all his musical instrument toys otherwise he won't interact with other toys. Tommy began to hum songs in between 18 and 24 months old, but he is now incorporating actual words while he sings. He even sings "Daddy, Daddy, Daddy" by his own inspiration. So I am incorporating music and singing in everything Tommy and I do together. Sing this song to the tune of "Frere Jacques." Follow the actions in the song.